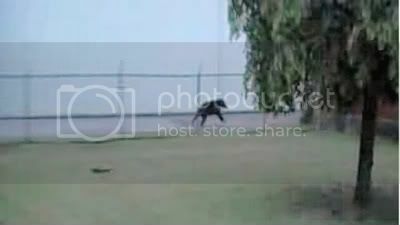 A bear tries to run away from police in Claysburg in this screengrab from YouTube. (3) rampant human supremacist attitudes. ANSWER: The standard posture of police departments toward unfortunate animals who happen to wander into human-inhabited areas. BY ANY RECKONING one might expect that in 2008, in the richest and supposedly “best” of all possible nations on earth, out of sheer shame if for no other reason, the US might sport a sophisticated system of police and civic “first response” to incidents whereby animals intersect with humans. Indeed, with trillions spent on criminal, unjustified and cowardly wars against practically defenseless nations; with untold billions stolen by corporations in broad daylight with the tacit connivance of a bought congress and an abetting executive, one can argue that this nation has no shortage of public funds, only the willingness to put social funds to proper use. So I submit it is irrefutable that if this nation wanted to have a civilized network of responders to animal “threats”—which we witness with increasing regularity—we would have such a network, and a model it would be, amply provided with all the tools that science and advanced animal behavior knowledge can marshal to this end. And guess what: It would be easy. But who are we kidding? For that to happen we need to clean house first, down to its systemic rotted roots. Clear the rottenness that disfigures our social priorities in every conceivable direction. Until then no compassion can be expected for terrified, cornered animals such as the one depicted in this story, animals that in the vast majority of cases present no threat to humans at all. As case after case like this makes the news, why do people put up with this contemptible state of affairs? CLAYSBURG, Pa. — From Rex’s gas station, where a stuffed bear greets visitors at the window with a sign around its neck saying “Please do not shoot,” to Shenanigan’s Bar, across the street from the scene, this small Blair County town is abuzz from Tuesday night’s spectacle, when police officers shot and killed a bear cub. The shooting took place in front of 150 to 200 spectators and a video of it has been posted on the Internet on YouTube, but the actual events remain in dispute, with the state Game Commission and police officers calling the shooting justified, and most townspeople claiming it was excessive and unnecessary. Hunters abound here, and while also mocking police officers for their poor aim, they insist the bear posed no threat and should have been let go. The game commission, which fielded inquiries from news organizations across the nation, put the blame squarely on the crowd for refusing to back away from the scene. Spokesman Jerry Feaser said the police and a wildlife officer, who initially shot the bear with a tranquilizer, took appropriate action. According to witnesses, it all began when someone chased the bear into a tree next to McCabe Trucking’s warehouse on Bedford Street. The cub remained in the tree as police from eight different departments gathered below, along with a crowd that filled the street. Officers shot the bear with a tranquilizer dart and it made its way down, but hopped to the other side of a barbed wire fence, away from the crowd, and eventually was cornered next to the warehouse. Witnesses said the bear then lay down. “He would have passed out there from all the tranquilizers,” said Donald DiVencenzo, who was in the crowd with his wife, son and grandson. Mr. DiVencenzo noted that the crowd was a good 150 feet away at that point, but said officers opened fire anyway. Witnesses said about 20 shots in all were fired, and the YouTube audio captured repeated gunshots. Many of those shots missed — leaving bullet holes in the facade of the warehouse — and the bear lumbered on, heading toward a creek and woods behind the warehouse. There it lay down again, and Mr. DiVencenzo said officers hit the bear with a final, deadly barrage of five to eight rounds. The video shows the crowd becoming increasingly hostile toward the officers, shouting profanities. Mr. DiVencenzo was arrested and charged with misdemeanor disorderly conduct, though he claims officers tackled and beat him after he yelled at one of them. Mr. DiVencenzo said he plans to file a lawsuit for police brutality and excessive force. He was the only one arrested. The police chief of neighboring Greenfield Township, Ronald Givler, said the unruly spectators were to blame for the death of the bear, and if they had dispersed from the start as officers asked, the bear would not have gotten agitated and would not have needed to be shot. One witness, Earl Richer, sided with police, saying it was a “50-50 chance” that the bear could have come running for the crowd rather than continuing toward the creek. “I see the perspective of the officers,” he said. But Claysburg residents clearly tilted against the decision to kill the bear, an order given by the game commission and not by police. Bears are seen frequently in the area, and they are usually tranquilized and carried away in a net. But no one brought a net Tuesday night, witnesses said, and there seemed to be an intent to kill from the start. The officers’ judgment also was called into question by townspeople, who pointed out that a propane tank and a gas line are in the area where they opened fire. The video posted on the Internet begins as the wildlife officer takes aim to shoot the tranquilizer. Had the crowd moved back prior to the firing of that dart, said Mr. Feaser of the game commission, the bear might have climbed down on its own. The proximity of so many people agitated the animal, he said. Once the bear was shot with the drugs, which take 15 to 45 minutes to become fully effective, the animal climbed down from the tree and took off running. Mr. Feaser said the bear, which weighed about 300 pounds, then turned to face the crowd and snapped its jaws. That’s when officers opened fire. If they hadn’t, he said, the bear could have reached the crowd in less than 5 seconds and hurt someone. Mr. Feaser also said the officers were right to fire so many times. Once the first round hit the bear, he said, officers needed to kill it rather than risk having a wounded bear get away or charge the crowd. Mr. Feaser said the commission obviously would have preferred the incident not to have ended with a death, but also pointed out that Pennsylvania has plenty of bears. The state population has rebounded dramatically in the last 25 years, from 4,500 in the early 1980s to 14,000 to 15,000 now. The story has spread worldwide on the Internet, where video on YouTube and local television stations’ Web sites have incited endless commentary. Daniel Malloy can be reached at dmalloy@post-gazette.com or 412-263-1731. Torsten Ove can be reached at tove@post-gazette.com or 412-231-0132. Disgusting attitude by our species. We have so much in terms of resources and can’t devote one iota to act with some decency?